The reign of the Raiders has ended. Mea Wong scored 13 points and Colton Collins added 12 as Kamehameha-Hawaii upset five-time defending state champion Iolani 57-54 last night in the quarterfinals of the Hawaiian Airlines/HHSAA Boys Basketball Division I State Championships. "I feel good for our kids. Now they can finally believe they can compete," Warriors coach Nelson Wong said. "I want them to enjoy this one, but we've got another big game tomorrow night." A stunned, near-capacity crowd at Radford's Jim Alegre Gymnasium saw the Warriors use a suffocating defense and precise execution to take a 12-point third-quarter lead. KS-Hawaii (26-6), the Big Island Interscholastic Federation champion, then withstood three comeback attempts by Iolani (21-8). "They've been winning state championships for as long as we've been a school," Mea Wong said. The Raiders, led by Case Miyahira's 16 points, got as close as 54-52 with 15 seconds left, but Wong hit two free throws with 14 seconds to go. 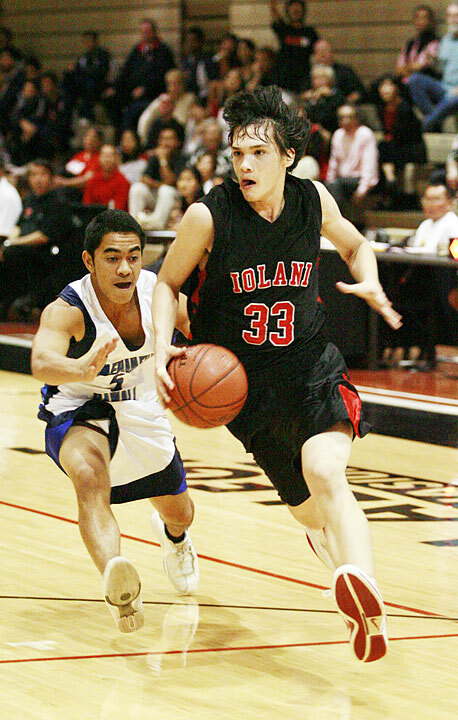 Iolani's loss ended the longest dynasty in state high school basketball tournament history. The Raiders, who were second in the Interscholastic League of Honolulu this year, hadn't lost a state tournament game since the 2001 championship final -- a span of 16 victories. "We have two seniors," Iolani coach Mark Mugiishi said. "We were young, but I don't like to make excuses. We ended up where we ended up." Mugiishi agreed that shooting woes were one reason the Raiders lost. "It's kind of an understatement. We missed 23 free throws," he said. "We didn't play real well. I gotta say they outhustled us. They played harder, went to the rebounds harder and they went to the loose balls harder." After Iolani's Pablo Warner hustled for a putback, the Raiders were down 56-54 with 4 seconds remaining. Wong made one of his two foul shots with 2.9 seconds left, then blocked a 50-foot shot attempt by Iolani's Ryan Dung as time expired. Kamehameha-Hawaii, seeded third in the tournament, was widely regarded as the underdog. Interscholastic League of Honolulu runner-up Iolani entered the week ranked No. 2 in the Star-Bulletin Top 10, while KS-Hawaii is No. 6 in the voting by coaches and media. The Warriors will face the Kaimuki-Saint Louis winner in today's semifinal round. "All season long, different guys have stepped up every single night," said Mea Wong, a senior point guard. Taylor Mounts powered the Raiders inside with 10 points and 13 rebounds. It was a frustrating finish for Iolani, which outrebounded the Warriors (32-31), but shot just 16-for-39 from the free-throw line, a shockingly low percentage for one of the better shooting teams in the state. Kamehameha-Hawaii had momentum and a somewhat comfortable lead midway through the third quarter. After Kealoha Kramer hit one of his two free-throw tries, the Warriors led 34-22 with 5:11 to go in the third. Iolani, which shot poorly to this point, finally caught fire. Miyahira drilled a 3-pointer from the right wing, and another from the left wing on back-to-back possessions. After reserve guard Bricen McCartney drained a 22-footer from the top, the Raiders were within 36-31 with just under 4 minutes left in the third. "We just didn't defend the 3s correctly," coach Wong said. "They know Iolani can hit that." Kamehameha-Hawaii raised the intensity level defensively to stave off the run. The Warriors' athleticism and length -- every starter is at least 5-foot-11 -- gave Iolani fits. Unable to get open looks from beyond the arc, they struggled to get penetration and turned the ball over several times on traveling calls. "I was actually surprised," Mea Wong said. "Their team is so quick, the fastest team we've seen all year." Hogan Rosehill scored on a fast-break layup to cap a 6-1 run that gave KS-Hawaii a 42-32 lead with 7:01 remaining. 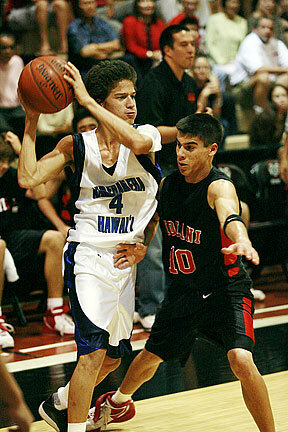 The Warriors continued to attack, launching missed 3-pointers, while Iolani went on a 10-4 run. Dung's 3-pointer on a fast break brought the Raiders within 46-42 with 2:34 to go. Isaiah Kekaualua answered with a trey from the left corner to boost the Warriors' lead to seven. Miyahira then hit two foul shots and scored inside on a backdoor layup. After Taylor Mounts scored from point-blank range on an inbounds play, the Raiders were within 51-48 with 1:41 left. After the teams exchanged one free throw each, KS-Hawaii guard Reece Alnas snuck downcourt for a long pass and easy layup to give his team a 54-49 lead with 32 ticks left. Miyahira responded with a clutch 3-pointer from the left wing, and Iolani was within 54-52 with 15 seconds remaining, but that was as close as the valiant Raiders could get. In their only other encounter, Iolani edged KS-Hawaii 53-47 in the semifinals of the Cardinal-Warrior Classic in Hilo on Dec. 7. It wasn't that loss, however, that set the tone for the Warriors. The players dedicated the season to the memory of Nelson Wong's father, who died at midseason. "His dad was his biggest fan," Mea Wong said. "Coach told us so many stories about him. I know it's been hard for him. Who wants to coach or play without his dad at a time like this? We dedicated every single game to him." Iolani--Kela Marciel 4, Ryan Dung 7, Case Miyahira 16, Taylor Mounts 10, Pablo Warner 6, Liloa Nobriga 4, Lionel Fujioka 0, Berton Wong 0, Bricen McCartney 7. Kamehameha-Hawaii--Mea Wong 13, Reece Alnas 9, Russell Kackley 2, Colton Collins 12, Kelii Kimi 4, Huaka Kuamoo 0, Isaiah Kekaualua 9, Chandler Kaaa 0, Cody Waltjen 0, Kealoha Kramer 5, Hogan Rosehill 3, Andrew Love 0. 3-point goals--Iolani 6 (Miyahira 3, Dung 2, McCartney), Kamehameha-Hawaii 3 (Kekaualua 2, Wong). The Bulldogs are one win away from returning to the state final after a heart-stopping win over the Crusaders. Beau Albrechtson scored 22 points on 11-for-11 shooting and Keone Reyes added 13 as Oahu Interscholastic Association champion Kaimuki (24-8)escaped with the win. Kaimuki used a triangle-and-two defense to limit Saint Louis center Scott Smith to 13 points and six boards. "It's the (Los Angeles) Lakers defense," Bulldogs coach Kelly Grant said. "If we go man on him, at least we can block him out." Saint Louis shot 43 percent from the field (23-for-54), while Kaimuki shot 69 percent (24-for-35). Reyes, a coast-to-coast key in Kaimuki's fastbreak, added nine boards and four assists. He credited post defenders Makalii Nahinu and Chauncey Nicola for their work in the trenches. "They were outstanding going up against Smith. He's an awesome player," Reyes said. Solomona Aigamaua led Saint Louis (22-6) with 14 points and Cole Shidaki had 10. Kaimuki outrebounded the Crusaders 29-21. The 'Dogs, who had several turnovers down the stretch, nearly blew a 51-43 lead in the final 1:40. Kyle Gonzaga, Cole Shidaki and Jamison Miller sparked a rally that brought the Crusaders within 51-49 with 1:02 left. Miller hit a turnaround shot off a missed free throw to keep Saint Louis within 53-51 with 33 seconds to go. Saint Louis--Kuli'a Aiona 2, Scott Smith 13, Cole Shidaki 10, Solomona Aigamaua 14, Jamison Miller 8, Ricksson Pacarro 0, John Quindara 0, Lucas Gonsalves 2, Kyle Gonzaga 2, Michael Tuiloma 0, Micah McClinton 0. Kaimuki--Daniel Colon 11, Brandon Madamba 5, Makalii Nahinu 0, Keone Reyes 13, Beau Albrechtson 22, Craig Cabudol 0, Chauncey Nicola 0, Ryan Kakitani 2, Desmond Tautofi 0. 3-point goals--Saint Louis 1 (Shidaki), Kaimuki 3 (Colon, Madamba, Reyes).